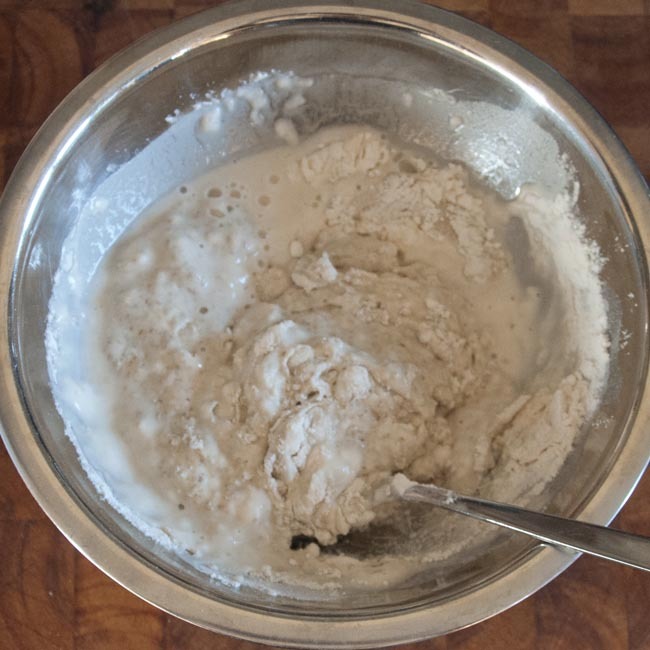 I’ve wanted a sourdough starter for ever so long – for as long as I’ve known and understood the sourdough process, I think. Traditionally baked sourdough is *the* great bread, by definition, in my opinion. With its wonderful texture and complex richness of flavour, it leaves the industrial ‘Chorleywood Process’ sliced white loaf so far behind that they’re hardly recognisable as the same animal. So when I saw that one of my favourite food bloggers, The Rowdy Chowgirl, had brewed herself up a starter recently, it made my mind up. I was going to do it, and I was going to do it NOW. Well, just as soon as I tracked down a bag of rye flour, anyway. And a couple of weekends ago, after following several different lines of reading and research, I got down to business. ‘What’s that?’ asked Hubby, as he wandered into the kitchen to see me stirring a bowl of what could only be described as goo. 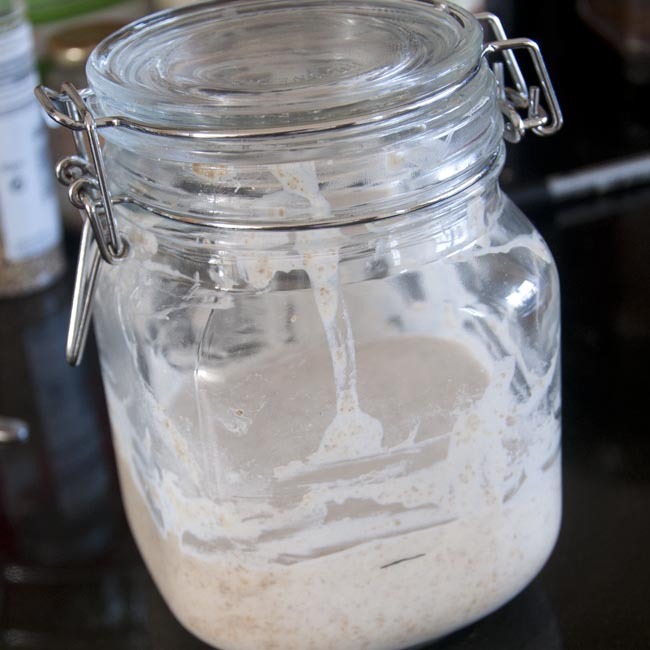 ‘A sourdough starter,’ I replied. He thought about it for a moment. ‘You realise you’re going to have to take that thing on holiday with you, don’t you?’ I tried to reassure him that I’d read about stashing it in the refrigerator for a period of time if necessary. He seemed unconvinced. I broadly used the directions from The Fresh Loaf, except that I don’t have US-type measuring cups, and there’s nothing called AP flour on the shelves in the UK. So I guessed a bit at quantities and used stoneground bread flour for the day 2 and subsequent additions. I also used my tap water rather than the mineral or filtered water suggested – mostly on the basis that it’s nice tasting water without an obvious chlorine hit, and I brew with it regularly without adulterating it in any way, so I went ahead and assumed there wasn’t anything in it greatly damaging to yeasty beasties. My starter was a thick batter-like consistency. Thicker the first day when it was rye flour, and then it thinned down a bit with subsequent additions. I used a 1l kilner jar I had lying around, with the gasket removed so that it wasn’t a sealed container, which I thought was a reasonable match for ‘cover loosely’. I put it to rest the first day in the boiler cupboard, which is a coupe of degrees warmer than the rest of the kitchen. After 24 hours, nothing much had happened, much as I expected. I made the first additions with plain flour, and stashed it back in the cupboard. It smelt… well, not exactly unpleasant, but definitely an ‘off’ smell, if you know what I mean. But, forewarned by lots of other sourdough devotees, I plugged gamely on. 24 hours after that, it had gone mental, doubled in size, and all bubbly and awesome. I was convinced I’d cracked it. I even named it, Gordon. Because, you know, ‘Gordon’s Alive! ?’ Anyway, as we all know, pride comes before a fall. I discarded half the mix and added more flour and water as instructed (well, kinda). Made my mark on the side of the container as instructed, and left it a few degrees colder in the kitchen this time. After another day had passed, the mix had risen a little in the jar, but only about 1/3rd and nothing like the doubling that the instructions called on me to wait for. So, I was patient. Another 24 hours on and no further progress, I mixed in a few teaspoons of rye flour to help things along. Still nothing more than a few scanty bubbles breaking surface. 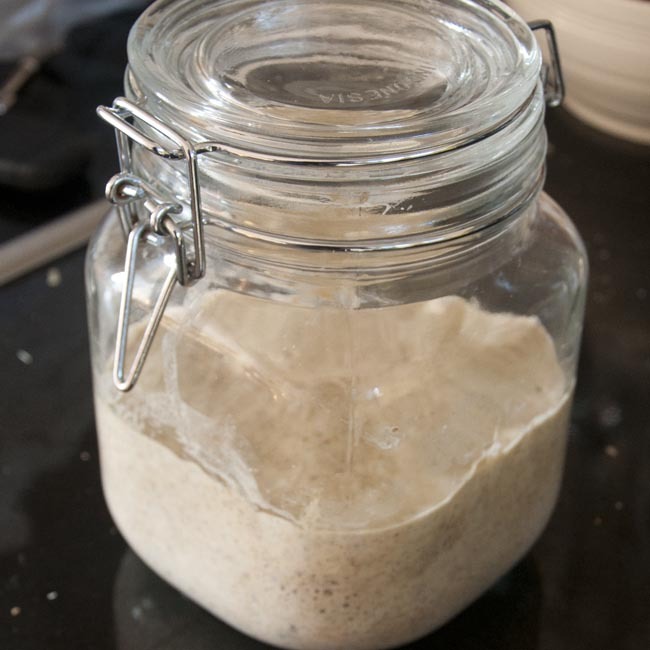 48 hours after adding the rye flour ‘booster’, I opened the jar and got a distinctly ‘musty’ damp sort of smell. On closer inspection the batter on the sides of the jar had started growing what was unmistakably black mould. Downhearted, I chucked the whole lot in the bin, disassembled the kilner jar and stuck that in the dishwasher. What I’d hoped was going to be a weekend of experimental baking lost, sadly, though given the hot spell of weather that was probably no bad thing! 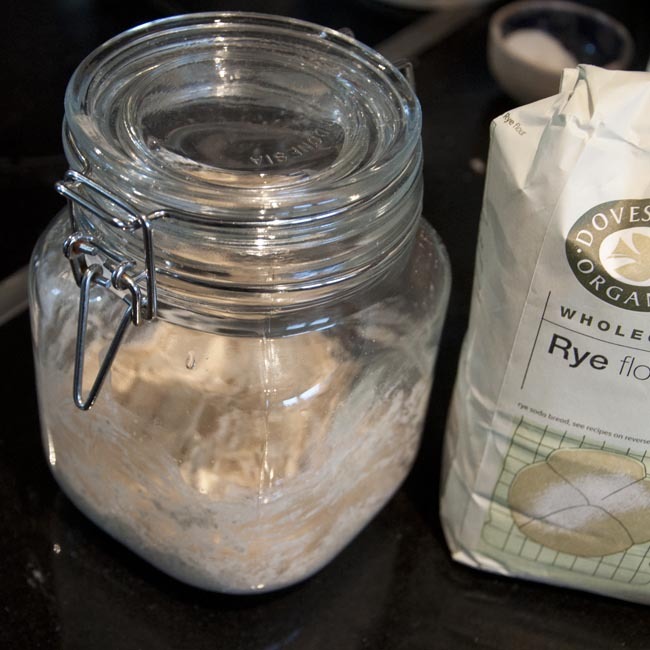 Some really kind feedback from @mannafromdevon, a baker on twitter, suggested that it might have been worth trying to rescue the ‘good stuff’ from underneath, and carrying on with feeding, but it was too late for sourdough-1, condemned to the rubbish. But their other advice, ‘Don’t Give Up’, stuck, and I’ve already started sourdough-2, which seems, so far, to be continuing in the tradition of acting as if it’s also read the sourdough primers, and wants no truck with them. Next – Sourdough Saga: Episode 2 – keep calm and carry on? Don’t give up! I neglected mine for weeks recently, the liquid at the top was black an horrible! I rescued some of the “good stuff” from underneath, fed it for a few days an bingo – right back to life. Once they start they’re hard to stop! You might want to check out my sourdough class review for a bit more inspiration on my blog , or join a future class via www. artisanskillschool.co.uk cheers! Was kinda hoping it wasn’t just me! Have to admit that the thought of begging and pleading for a starter had crossed my mind… but I refuse to give up just yet! 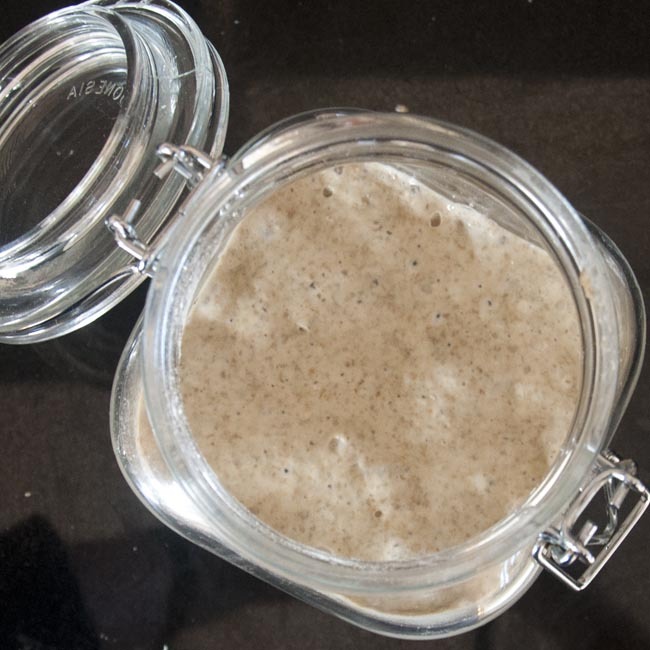 I’m so pleased that my sourdough starter inspired you to try it yourself–what a bummer that your first batch died. If only you lived nearby, I’d just give you half of mine! Crossing my fingers for your next batch! Thanks for your reply – all of this is really interesting! I’m a brewer, so most of what I know about yeast, I know about brewer’s yeast, where you oxygenate energetically at the start and then let things go anoxic after that. I’ve been whisking things energetically at feeding time on this basis. 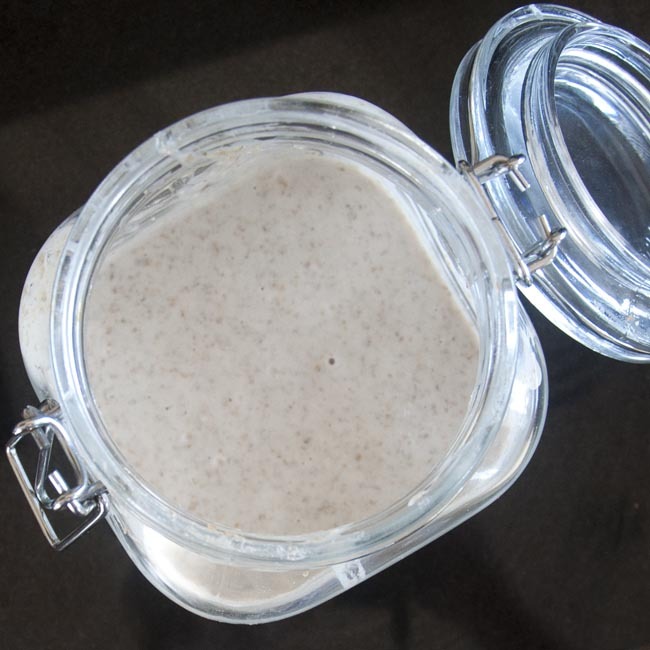 When it comes to sourdough there seems to be a divide between the people who say the yeasts / lactobacilli come from the air, and those that think they come from the flour – it’s all a bit confusing! I just wish the yeast had read the manual!